Clinton Won't Go As Far As Rivals On Minimum Wage Or Rule Out Oil Pipelines : It's All Politics In an interview with Iowa Public Radio, the Democratic candidate declined to endorse a $15 minimum wage, citing differences in the economy across the country. 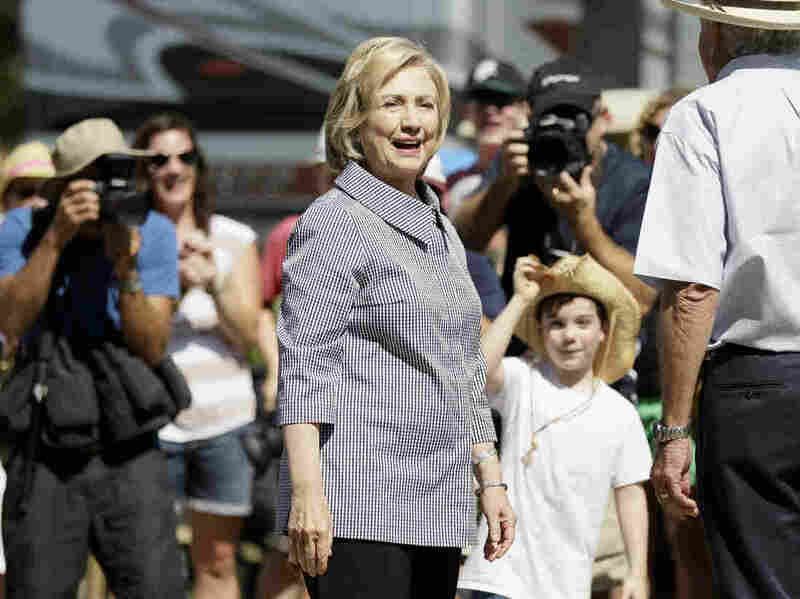 Democratic presidential candidate Hillary Clinton visits the Iowa State Fair on Saturday. In an interview with Iowa Public Radio, she discussed the minimum wage, oil pipelines and the future of the Affordable Care Act. Continuing to keep an eye on the general election, Hillary Clinton would not endorse a $15 minimum wage like her Democratic rivals for the presidential nomination in an interview with Iowa Public Radio. She also would not rule out approving controversial oil pipelines in a Clinton administration, if she were to become president. She also addressed the controversy surrounding her use of a private email server while secretary of state. "It would have been probably smarter not to" have used a private server, she said. Despite Vermont Sen. Bernie Sanders, I-Vt., appearing to gain on the presumed Democratic front-runner in key states, Clinton told Iowa Public Radio's Clay Masters she would support a Senate proposal to raise the minimum wage to $12 an hour, far above the current wage of $7.25 but not as far as the $15 wage backed by rivals Sanders or former Gov. Martin O'Malley, D-Md. She said she supported efforts in high-cost cities to raise the wage higher but added of raising the federal wage, "I don't think that is in any way enough to deal with the income stagnation that we face in our country." Clinton said she did not see political risk in the move. "No, I think it's a recognition of the reality of the economy in different parts of the country," Clinton said. "And I think it's important to get the federal minimum wage up, but to appreciate the differences in cost of living and job markets in other places." Clinton's comments in Iowa, where she addressed Democratic activists in Clear Lake on Friday and attended the state fair in Des Moines on Saturday, were firmer than what she offered last month after meeting with labor leaders in Silver Spring, Md. Then, she said the $12 proposal by Sen. Patty Murray, D-Wash., was more realistic than the $15-an-hour plans proposed by Sanders and O'Malley. "Let's get behind a proposal that actually has a chance of succeeding," Clinton said then. Clinton was also asked if she would support building oil pipelines. While she said she leaned toward states coming up with clean energy plans, she would not completely rule out pipelines. "I'm not saying 'No,' but I'm saying my heavy bias is in favor of moving away from fossil fuels, however they are delivered," said Clinton, whose State Department was evaluating the Keystone XL pipeline from Canada to the U.S.
She has not taken a position on the pipeline and whether she would approve it as president if President Obama does not. "I mean, if it's not a pipeline, it's going to be railroad cars or it's gonna be trucks, and so it's not like the pipeline's the only way it can be delivered. And we should ask the bigger question, 'How can we move more quickly to a clean energy future?' "
Clinton again defended her use of a private email server as secretary of state, contending, "I did what other secretaries of state have done." She also again pledged to fight for Obamacare, though she said prescription drug prices and deductibles are too high. "We have work still to do on the Affordable Care Act," she said. "No. 1, I have to defend it. Obviously if a Republican were, heaven forbid, to be elected president, it would be repealed; they've all promised it. And if the Congress stays Republican, we would be starting all over again. And I have the scars to show from how hard it is to get to where President Obama and the Congress brought us." Clinton declined to take shots at her Democratic rivals, saying she was more concerned with Republicans. "I think it's great that we're having such a vigorous Democratic primary," she said, "and I think what we're talking about and the issues that we're focused on are so different than what's being talked about on the other side. So I'm now really concerned about the Republican debate." Clay Masters, Iowa Public Radio: So you've been spending a lot of time in Iowa recently, making a lot of weekend trips. Tell me what are two to three words that you would use to describe Iowa? Hillary Clinton, Democratic presidential candidate: Open, committed, and beautiful. CM: You mention your education policy. You introduced some policy regarding higher education affordability. A big discussion in Iowa right now are some recent vetoes of $56 million that Gov. [Terry] Branstad instituted for K-12 education. You've been critical of the governor's action. As you see it, what's he messed up here? HC: Well I have been critical because I know how difficult it is for a legislature — one body controlled by Republicans, the other body controlled by Democrats — ever to reach a consensus, and in this case, on two very important issues to the people of Iowa — funding education and providing mental health services. The Legislature reached such an agreement and sent a bill to the governor to deal with both of those issues. Unfortunately, the governor vetoed them. And in particular, the funding of education had been a big issue throughout this whole legislative session; I heard about it from the first trip I made to Iowa in April. And people were expecting if the Legislature reached agreement, they could make plans. School districts were looking at what they needed to do with material, equipment, teacher salaries and contracts. And then when it was vetoed, that was a very unfortunate decision by the governor. Both because the Legislature had believed and a lot of people had relied on their belief, that once they reached agreement, they would see this through. I think it said a lot about some of the priorities and values that the Republican administration here in Iowa has. CM: So you've talked a lot about pre-K, you've talked a lot about college affordability, there's a big gap in between those two time periods in a child's life that are pretty important. What needs to be done with K-12 funding, when we look at No Child Left Behind, which not very many people love, there's a lot of debate over Common Core, what would a policy from you to get K-12 funding, K-12 education back on track? HC: Well, I think that the federal government has a couple of very important roles to play. First, with special education, which is an increasing part of the budget of a lot of school districts. When special ed became the law of the land and children with disabilities were to be mainstreamed into classrooms, the federal government promised to pick up 40 percent of the cost. So far as I remember, the feds have picked up no more than 17 or 18 percent of the cost. I have as a senator, I would as a president, work to get that number up. We made a commitment which we have never fulfilled. Secondly, I think the federal government has an important role in trying to help low-income students do better, help poor districts be more competitive, and that was the original idea behind the Elementary [and] Secondary Education Act back in the 1960s, that there would be money from the [federal] government that would provide more equity; I think we've kinda gotten off track on that. And there are, in many places in the country, and even in a few places in Iowa, urban and rural districts that are unable to really meet the many needs that their kids bring to school. And then finally, I'm a big believer in looking at what works, and we have reams of educational research, but instead of really zeroing in about what is it we should do in partnership, the federal, state, local governments and school districts working with families and parents and communities, for the betterment of a student's education, we kind of go from fad to fad and I think we ought to take a hard look about what works and there should be incentives for doing more of what works and let's stop some of these faddish ideas of the moment that don't really hold up under scrutiny. CM: Another big topic in the state, moving a little bit to environmental issues, there's a company that wants to build a crude oil pipeline from the Bakken Shale in North Dakota through Iowa. Of course there's the Keystone XL pipeline, which you've said you're not weighing in on at this point. We're in a state, you pull the lens back, we're in a state that almost 30 percent of its energy comes from wind. The Iowa Corn Growers Association says almost 50 percent of the corn grown here goes to ethanol. Does it make sense to be building more oil pipelines when you and many other Democrats talk about moving more to clean energy? HC: I think that's one of the questions we should be debating in this campaign, because I want to see us put our resources and our political will behind clean renewable energy. And every time we deviate from that, we fall behind in what we're capable of doing. I support the president's clean power plan and I would like to see us begin a transition away from fossil fuels. Now, the specifics of that are important, because some parts of the country are better able to make that transition than others. I would argue Iowa is better positioned to make that transition. You're at 30 percent on wind; you're beginning to do more investments in advanced biofuels for a number of advanced power uses. When I visited the new bus station in Des Moines, you're using solar. And you're also getting economic benefit because you're using old factories and plants to manufacture turbines and other technology that can be used for clean energy. So I would like to say, as president, to every state, "Let's have a clean energy plan, don't be citing pipelines, don't be citing anything having to do with coal or fossil fuel, until you've really looked at both the economic and the environmental necessity." CM: So you're not saying, "No new pipelines"? HC: I'm not saying "No," but I'm saying my heavy bias is in favor of moving away from fossil fuels, however they are delivered. I mean, if it's not a pipeline, it's going to be railroad cars or it's gonna be trucks, and so it's not like the pipeline's the only way it can be delivered. And we should ask the bigger question, "How can we move more quickly to a clean energy future?" CM: Your biggest opponent in this race right now is Bernie Sanders. He's gone after you on a couple issues, trade, Keystone XL pipeline, just to name a couple. When do you start taking him [on]? HC: I think it's great that we're having such a vigorous Democratic primary, and I think what we're talking about and the issues that we're focused on are so different than what's being talked about on the other side. So I'm now really concerned about the Republican debate. I mean, you could watch that debate the other night, 17 candidates all together for four hours. You didn't hear much about college affordability or debt, you didn't hear much about what we were going to do to get incomes rising again, because they only have one solution — cut taxes on the wealthy and get out of the way of corporations — which doesn't work. So I'm really focused on laying out my policies and explaining them and drawing the contrast with Republicans. CM: At the same time too, this is a swing state, you're going to have to excite voters for, what, another 16 months here. I've talked to some Iowa, some Iowans, some Democrats who have said that they're not excited to caucus, or that they've said that they've signed up to volunteer for you but they're saying, "Eh, I'm not going to do it right now." Some people have talked to me about trust issues because of the email fiasco. How do you keep people engaged? HC: Well first, let me say on trust, I don't like reading that obviously. But I am absolutely confident that by the time the caucuses roll around on Feb. 1, Democratic and independent voters here in Iowa are going to know that when it comes to fighting for them, standing up for them and their families, being on the front lines on the issues that matter to them economically, especially how to get incomes rising, that I'm the person who is not only on their side, but can actually deliver results. Y'know, we're in the middle of August, there's a lot of other things to do besides get really revved up about politics, but we have an enormous volunteer base, I get reports every day of the number of people signing up, they're making phone calls, they're canvassing, they're hosting organizing parties. We have a dedicated supporter in every precinct in Iowa. Look, anecdotal evidence doesn't really cut it with me; I want to know what the data shows, what the facts are, and the facts are pretty clear that we're building a really strong organization in Iowa that I think is going to do really well on Feb. 1. CM: Is there another shoe to drop with the email fiasco? HC: No, no, look, I understand why people are confused about this, it's a very confusing issue. I think there's just a couple things that people need to know, which is, I did what other secretaries of state have done. I was permitted to and used a personal email and, obviously in retrospect, given all the concerns that have been raised, it would have been probably smarter not to. But I never sent nor received any classified email, nothing marked "Classified." And I think this will all sort itself out. And in a way, it's kind of a interesting insight into how the government operates. Because if I had not asked for my emails all to be made public, none of this would have been in the public arena. But I want people to know what we did, I'm proud of the four years I was secretary of state. So I know this is all just going to work itself out as we go forward. CM: Another big issue in the state seems to be almost every year, a minimum wage bill comes up in the statehouse. Sen. Sanders supports a $15-an-hour wage. These bills come up year after year; they don't go anywhere. You've discussed the value of cities and states setting it. What should the federal standard be for the minimum wage? HC: I support the bill introduced by my good friend and former colleague, Sen. Patty Murray from Washington, and sponsored in the House by Congressman Bobby Scott from Virginia, setting the federal minimum wage at $12. But I also strongly support cities and states looking at their own particular circumstances. The cost of living in New York is not the same as it is in Little Rock, Ark. And therefore, I supported a $15 minimum wage in New York City. And similarly, Los Angeles has just voted for a $15 wage, but I don't think that is in any way enough to deal with the income stagnation that we face in our country. So let's raise the federal minimum wage — I supported that when I was a senator — let's encourage cities and states to see what more they can do, and let's remember that two-thirds of all minimum wage workers are women, many of whom are single moms raising their kids. So this is an economic issue, it's a fairness issue, it's an economic justice issue and it's a women's issue. HC: No, I support the $12. I support the $12 that is in the bill that Sen. Murray and Congressman Scott have introduced. I think it's a good floor and that would mean that Iowa would have to go up. And I strongly support cities and localities, even states, that want to raise it beyond $12. CM: Do you think there's a political risk in endorsing a lower minimum wage than some of your opponents support? HC: No, I think it's a recognition of the reality of the economy in different parts of the country. And I think it's important to get the federal minimum wage up, but to appreciate the differences in cost of living and job markets in other places. So Seattle, LA, New York, places like that where there's a big job market, there's a lot of opportunities for new entrants into the workforce, going to $15 makes sense economically. But there are lots of places in other parts of the country where that would not. So let's get to $12, that's going to be hard enough with a Republican Congress, and let's encourage more states to look at themselves and see what more they could do to try to make it possible for people who work full time and are paid minimum wage to actually bring home enough pay to support themselves and their family. It should not be in America that when you work full time you are still mired in poverty. That's wrong. I want to encourage work. I want to get back to the basic bargain, where, in America, if you work hard and you do your part, you should be able to get ahead and stay ahead. And the minimum wage is that: it's minimum. And we should be layering on top of it. And we should keep the pressure on a lot of big employers, who, in my view, have not moved fast enough to increase wages for all their workers. So I think we have some real opportunity ahead of us and it's a big part of my agenda. CM: We have time for one more? You gained the support, the endorsement of Sen. Tom Harkin, former Sen. Tom Harkin of Iowa, he talks a lot about, or has, at that final Steak Fry, he said, "The Affordable Care Act: Hillary Clinton's fingerprints are all over that." In a Clinton administration what would be next for the Affordable Care Act? HC: Well, first of all, I am so honored and delighted to have Tom Harkin's endorsement; he's a friend, he was my colleague for the eight years I was in the Senate, and to have him give me his seal of approval and talk about the common commitment we have to social and economic justice, just means the world to me. And I agree with him completely. We have work still to do on the Affordable Care Act. No. 1, I have to defend it. Obviously if a Republican were, heaven forbid, to be elected president, it would be repealed; they've all promised it. And if the Congress stays Republican, we would be starting all over again. And I have the scars to show from how hard it is to get to where President Obama and the Congress brought us. I do think it can be improved and I'm looking at ways to do that. For example, I think the cost of drugs is way too hard for so many people to afford. These high prices are putting necessary drugs out of the reach of a lot of people. I think the deductibles are too high in many of the policies and the out-of-pocket costs are too high. So we're going to be looking at how we defend the Affordable Care Act but how we go to the next level, to make sure its promise is fulfilled. And I'm excited about that, because I'm thrilled that we have 16 million Americans that finally have health care that didn't have it before. I just want to make sure it's affordable for everybody. CM: All right, Secretary Clinton, thanks for taking the time to talk with us today. HC: My pleasure. Good to talk to you. Thanks.